I shall try and list all the flowers and foliage I included – I did go a bit overboard, but wanted something big this week! 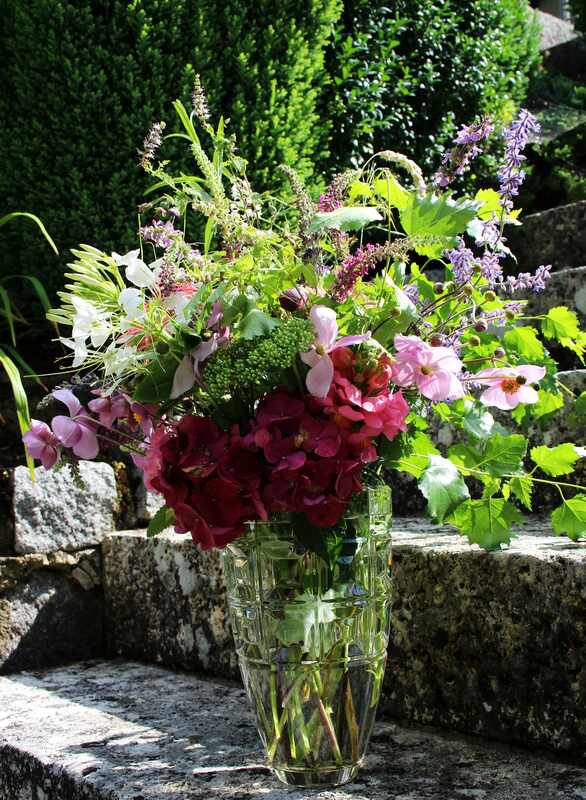 Silver birch foliage, Japanese anemone, Buddleia alternifolia stem, Buddleia buds, Hydrangeas (deep red and pale pink), Heuchera, Apple mint, Perovskia, various grasses, Teucrium (wild T. chamaedrys and T. hircanicum), Zinnias, a white Cleome, a sedum bud, Geranium phaeum, and a pink antirrhinum. The Cleome certainly looks exotic, with its spidery petals, and yet the Anemones are so familiar it is hard to imagine European gardens without them. All these foreigners crowding into gardens do create greater diversity indeed. I wonder how many plants in my garden are actually of German/ Central European origin! … something for me to ponder over during the summer. Thanks as always to Cathy at Rambling in the Garden for hosting this meme. This entry was posted in Uncategorized and tagged Cut Flowers, Garden, Seasons, Summer. Bookmark the permalink. A gorgeous mix that comes together perfectly. United Nations of flowers. You do have a great variety of lovely blooms. That dark red hydrangea is gorgeous. This is among my favorites. I appreciate the flowers selections, many grace my garden. Very nice post. Cathy, another stunning vase of color to begin the week! Your post always brightens my Monday. Such a lovely range of flowers and leaves. 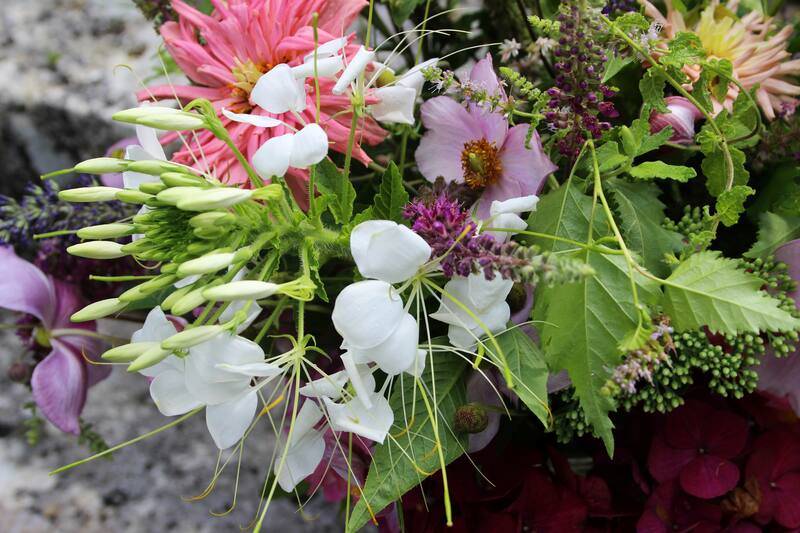 The Cleome is stunning, and the whole vase looks bounteous. A United Nations of flowers is a wonderful idea …. Yes, nature often finds it easy to adapt to new environments, so we can all learn from that I think! The red of the hydrangea is beautiful, a recent report in the uk concluded that life for the pollinators would be poorer if they had to rely on only our native plants who have such a short flowering period. That’s an interesting thought Brian. I wonder… something else for me to ponder over! A wildly romantic mixture, Cathy! Vivacious and gorgeous. Yes, what a yummy selection – and the photos make the vase look so much bigger in the first picture than the last! Interesting to see wild teucrium. Love that cleome! i trimmed the flowers from my mint a few days and consigned them to the compost heap before realising how pretty they would look in a vase…! I often find the contents of my vase start off with prunings! 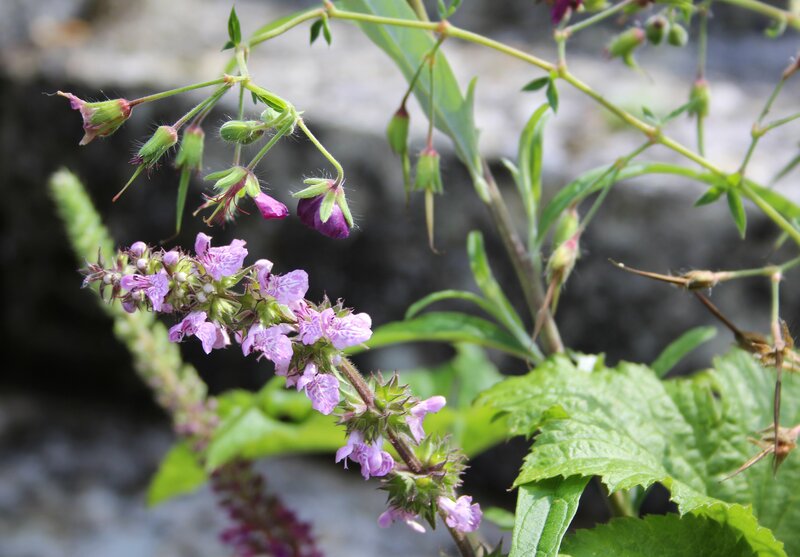 The mint looks lovely in flower, but it does tend to spread too much if left. 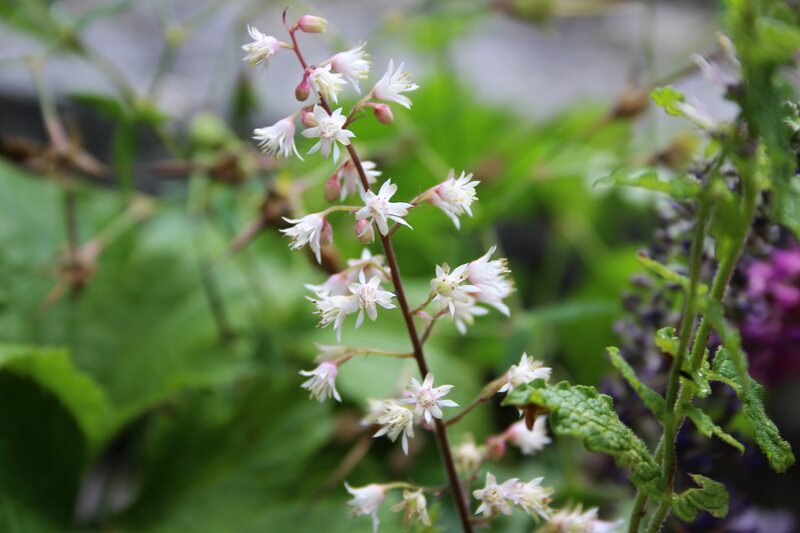 I wasn’t sure about the wild flower at first, but then saw that the leaves are practically identical to the Teucrium in the rockery, which helped me identify it! I have put my mint in a pot which is sunk in the ground, which of course helps – but must remember to use those flowers next time!! They may be diverse, but they create one big, happy family! Do you know the cultivar of the red hydrangea? It’s eye-catching! All those flowers make an exuberant summer display, Cathy! I don’t think I’ve ever seen hydrangeas in such a wonderful, deep color before. As to the Japanese anemones, I’m amazed every time I see them in the posts of the European bloggers – they’re a fall flower here. The anemones usually flower from the end of July onwards here. Perhaps they wait for cooler weather to flower in your climate. How clever of you to see the beautiful diversity in your garden and celebrate it! If only we did this so perfectly in our individual communities, right? Your thoughts made me smile, however, as I am working on substituting many of my existing plants for an increase in California natives. So I guess I’m actually working against diversity. I sure hadn’t considered that before. 🙂 Your bouquets are always lovely but this week, spectacular. The Cleome really is a show-stopper. Great ”all together” vase! It is a theme that I usually use when I write about my garden. And a theme that affects us all I think… in many ways! That is a stunning bouquet. It’s pretty difficult for anyone to grow those deep red Hydrangeas here but they make a striking addition to the mix. I think we are all growing lots of things with Germanic origins if we go back and look. Hard to tell when they come up with Anglicized names for marketing purposes. That hydrangea was new thus spring, and is in a pot right now, so it will be interesting to see what colour it is next year after being planted out in autumn! I don’t think you went overboard at all. Your vase is gorgeous. I love that deep purple hydrangea. That’s gorgeous. All of mine are struggling in this heat. I may have to retire them as well and work toward more native plants. Sigh. Thanks Alys, that Hydrangea has now gone over already but was a real show. Yes, sometimes the natives just cope better with the conditions on offer.